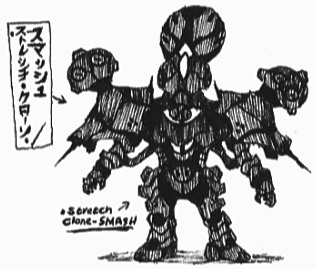 The Stretch Clone Smash was one of the Clone Smash created by Nariaki Utsumi, based on the Stretch Smash. Alongside the Press Clone Smash, it was summoned by Blood Stalk to fight Kamen Riders Build and Grease during the battle for the Pandora Box. They were ultimately destroyed by Ryuga Banjo when he used the Cross-Z Magma Knuckle to become Cross-Z Magma. The Press Clone Smash was one of the Clone Smash created by Nariaki Utsumi, based on the Press Smash. Alongside the Stretch Clone Smash, it was summoned by Blood Stalk to fight Kamen Riders Build and Grease during the battle for the Pandora Box. They were ultimately destroyed by Ryuga Banjo when he used the Cross-Z Magma Knuckle to become Cross-Z Magma. The Flying Clone Smash is a cloned and enhanced version of the Flying Smash Hazard. It is destroyed along with the second Strong Clone Smash by Grease.